How Much Would you Pay for a Self-Published Ebook? There's been a lot chatter lately about how much an ebook should cost, as evinced by a recent spat between MacMillan and Amazon, which got so heated Amazon pulled all of Macmillan's titles off its site for a day. Yikes! People in the industry are taking the pricing of ebooks seriously, and I think self-published authors should, too. The funny thing is, it all seems like much ado about nothing to those, like me, who have never read an ebook. I remember last year when I first released a digital version of Ghost Notes on Amazon for its Kindle device. I didn't, and still haven't, seen the final product. I had to shanghai my sister, who owns a Kindle, into buying a copy. "Does it look right?" I asked. "Does it look like other digital books on the Kindle? Does it look like it's supposed to look?" But as a self-publisher, I don't want to ignore this segment of the book-buying public. I have to put the same kind of effort into producing a quality ebook that I might into producing a quality book-book. I have to format it correctly, and I have to make sure it looks as good as--or better than--the other ebooks people are likely to read, and in each of the many formats they're likely to read them in. Luckily, the book writing part is done. But how much should you charge for a quality self-published ebook? And should you charge less because it's self-published? Most of the wrangling between Amazon and MacMillan seems to be about prices that range from $9.99 to $14.99. That would be a nice take for a self-published novelist, but my approach to self-publishing is more modest. As I've said before, I think of myself as playing in the minor leagues of publishing, and I wouldn't expect people to pay for a game at Yankee Stadium when they're going to see the Toledo Mudhens. They'll see some pretty good Mudhens baseball, but still. 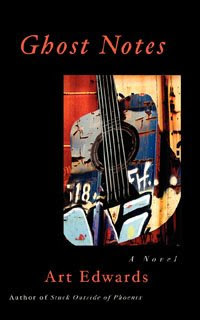 Therefore, I've chosen the price point of $4.99 for the new edition of Ghost Notes the Ebook at Smashwords. It's available in any format you could want--even PDF if, like me, you don't own an ebook device--and you can download a sample of the novel for free! $4.99 seems like a reasonable price, and it might entice a few of those who balk at a $14.99 sticker price to buy my book instead. What do you think? Would you pay top dollar for an ebook that's self-published? Would you pay anything? "There is a poignancy to Art's writing which gives his book a rare authenticity." "As writers go, [Art Edwards is] the real thing and this book is a lovely, memorable read." These are the kinds of accolades that are hard to come by for the self-published writer, so I'm thrilled to get them. Thank you, Jane, for your generous read. And all this on the heels of a slam dunk review at the Boogle, as well as Ghost Notes winning PODBRAM's contemporary fiction title of the year award for 2009. I think reviewers of self-published works are worth their weight in gold, and I think more of them are needed. I'm cooking up an idea that will turn not only me, but you, into a reviewer of self-published work, at least for a short time. More on that later. So, what led to this swell of interest in my work? And more importantly, what can we learn from it? First of all, I understand this is modest success--success really comes from readers, not reviews--but the coincidence of having so many good reviews hit at once is worth exploring. Also, everything I say below assumes you have a good self-pubbed product, and that you're doing the usual press release/blog/"getting your name out there" type stuff to corral attention for you and your work. When Ghost Notes was first released at the beginning of 2008, I had a hard time getting reviews. It was even harder than getting reviews for my first self-pubbed effort, Stuck Outside of Phoenix, the first edition of which came out in 2003. When I released the audio book version of Ghost Notes, well over a year after the print version in June of 2009, and sent out a press release asking people to review that product, bloggers all-of-a-sudden took an interest in my book. Here's the irony: They all wanted to review the print version. I sent out a press release for an audio book, and everyone wanted the print edition to review. Why was that? Was June 2009 a better time to send a press release than March 2008? Do bloggers like it when you have an audio book version of your novel? Did I start praying a lot? It had more to do with who I sent those June 2009 releases to. Two of the three review sites that eventually reviewed Ghost Notes (The Boogle and The Self-Publishing Review) didn't exist when I originally released it in print form, and at the third, the reviewer (Celia Hayes) hadn't yet started reviewing at the blog I was submitting to (PODBRAM). So, in other words, when I'd first started pushing Ghost Notes, none of the reviewers who eventually responded favorably to my work were reviewing self-pubbed work yet. They never got a shot at the original release. With the audio book press release, the blurb for Ghost Notes piqued their interest, and they requested the print book. So, what's the moral of the story? Even though your self-pubbed book came out years ago, you have to continue to send out press releases and review requests. New blogs might be receptive to your work, or old blogs might change their tune. The self-pub review landscape changed from March 2008 to June 2009, and it's probably changed again since then. You just have to keep trying, keep looking for folks who might like our work, and if your work is good, it will eventually see a little light. And, hey, you're self-published, so your marketing plan need never end. Try Ghost Notes, the award-winning novel, for just $5. Like many writers, I'm interested in getting an agent. That's why I like it when agents post stats on their blogs announcing the number of submissions they receive during a given period, and the number of new clients they take on. Well, "like" might not be the right word. Recently, I've read such stats from three different agents, giving us snapshots of their 2009s. The results are pretty interesting. First, there's Kristen Nelson of the Nelson Literary Agency, who posted such stats at the end of last year. I encourage you to read all of her numbers, but for the purposes of this blog, I'll focus on two. Assuming these new authors all came by way of query, and assuming I did my math correctly, that gave someone sending a query to the Nelson Literary Agency in 2009 a .0016% (not "16%" but WAY less than 1%) chance of securing representation from them. And the odds have dropped at this agency since 2006, when they took 20,000 queries and took on eight new clients. Popular agent, Kristen Nelson. Rachelle Gardner, literary agent, is more ballpark than specific, but she claimed in a 2009 blog to receive around 500 queries a month, and takes on "one or two" new clients a month. Again, if we assume all of her new clients come via query, and we assume the best-case scenario of two authors a month, that put the odds at .4% of you getting the Big Call from Rachelle Gardner. That's still less than 1%, but WAY more than WAY less than 1%. So that's 500 queries to get one or two authors. Then there's Jet Reid. Reid's numbers are a little different, as they focus on the number of offers to authors after requesting their full manuscripts, but they're revealing nonetheless. In 2009, she requested 124 novels (all full MSs) and offered representation to two authors, putting the odds of getting an offer of representation from Jet Reid in 2009 after receiving a full MS request at about 1.6%. There are other agents who have posted stats over the years, but these numbers are pretty current, so the most relevant to those looking for an agent. First of all, these are only the stats of a few agents, and web-savvy agents at that. I suspect high Internet profiles lead to more submissions for them. In other words, less web-savvy agents might receive fewer submissions, which might increase one's odds with them. Still, these are just the odds of getting an agent, not the odds of getting published. As not all agented MSs get published, the odds of getting published only go down from there. I doubt anyone in commercial publishing would say the odds of success for any aspiring writer in 2010 are any better than 1%. Now, I don't give much credence to odds. As Rachelle Gardner wrote in the blog linked above: "About zero percent of writers with uninteresting queries become my clients. 100% of writers with queries that knock my socks off will get a request for a partial or full." Either your project is going to succeed or it isn't, and I refuse to put my work in the same soup as every query that comes over the transom at these agencies. How someone who doesn't work as hard as I have for as long as I have fares in commercial publishing isn't really relevant to the possibility of me finding an agent, getting published, or having success. So, d0 I bring all this up just to ruin your day? Can the odds of succeeding at self-publishing be much lower than that? Answer in the comments section. Why Would the Yankees Disparage Little League? 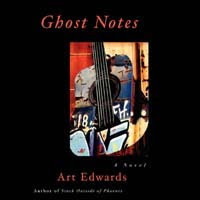 The digital download of my unabridged audiobook, Ghost Notes, just came out at Amazon! Take a gander. Read eloquently by voice actor James Lorenz, this is the audio version of my second novel, the same one that just won PODBRAM's Best Contemporary Fiction Award of 2009. You can sample the audio tracks here. From my poll last week, it looks like most agree that there's nothing inherently vain about any of the paths chosen by our three writers--or they're all vain in the way all writers are vain. One can only imagine what the results might've been if the same poll had been conducted a decade ago, but I'm guessing Subsidy Sam--or "Vanity Vince," as he might have been dubbed--would've fared much worse. For me, the word "vanity" is greatly overused to describe various kinds of writing and publishing in 2010. Yes, there are vanity presses that have earned that moniker, but I think the professional writer has to ignore the term and focus on the business of what she's doing. Publishing is a business, and if you want to be a pro, concentrate on making pro decisions (better product, fewer dollars, more audience). Do that, and whether you're vain or not will take care of itself. I've pursued each of the avenues of Novelist Nick, Lit Mag Lucy and Subsidy Sam, and I'm thankful there are so many possibilities in the 21st Century for a writer to get a foothold. Frankly, we need all the avenues we can get. I used to hope that print-on-demand technology and ebooks would make self-publishing a kind of minor leagues of writing: semi-pros working diligently in the field and hoping one day for the big "call-up." I think they're slowly becoming that. The problem for the professional writer is that these avenues to print are not only becoming the minor leagues of publishing but also the high school leagues, the beer leagues, the pony leagues, Little League, and the pick-up game at the local park. Self-publishing is available to anyone who can string enough words together and has a credit card in his pocket. And guess what? Each of those books gets an Amazon page, just like yours. Still, the way to distinguish your work from others' isn't to disparage those who are giving publishing a try at some tier other than yours. Do the Yankees disparage the local Little League? Of course not. Why? Because the Yankees know that the local Little League is where people learn the rules--and the beauty--of baseball. Not only that, but they'd be disparaging their market. The more people who know and understand good publishing, the bigger the market for quality work, no matter how it's published. See you at the ball game.